Santa Claus goes High Tech! 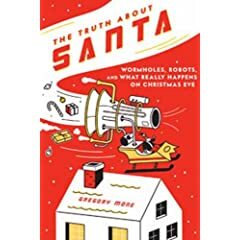 I was browsing NPR online when I spotted this funny titled: Author: Santa Claus Relies On Robots, Gadgetry. Sounds interesting hum? Well what if your high-tech child asked you about Santa Claus? Not too many kids buy the ‘he is a magical character’ these days, so Gregory Mone came up with this book which seems quite fun (and smart). Gregory was able to put up some cutting edge science and technology magic into his book. → Hold on, save some popcorn for later! ← Acer’s Black Screen of Death hitted mini-me!